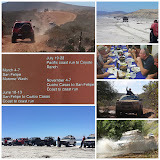 Camp4lo Baja Off Road Tours : New video of our Baja off road tour. Want to see more of what we do? Here is a little video reel of our last Camp4lo Baja Expidition. Give us a call today and we can help you with your Baja off road adventure!